Most people wish they could get better sleep. But taking something like a prescription sleeping pill or an over-the-counter one could be hazardous to your health. So what do you do if you want to improve the quality and the quantity of your sleep if you don't want to take drugs in order to accomplish the task? Well, most people lean on natural sleep supplements in order to solve this problem. And you can do it, too. There are plenty of natural sleep supplements out there which can work as well - if not better - then the synthetic chemicals you'll find in most prescription and non prescription sleep aids. 5-HTP is one of them. It is a natural precursor to serotonin that your body uses in order to improve the balance of neurotransmitters in the brain. These neurotransmitters can help you maintain a positive mood. If you'd like to learn more about 5-HTP, as well as what it can do for your sleep issues, then we think that reading the rest of this educational article would be very beneficial for you. 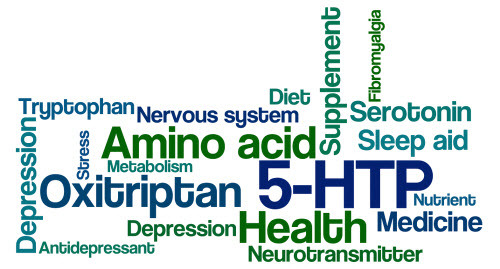 What Does 5-HTP Do in the Human Body? 5-HTP actually performs a lot of important biological functions in the human body. Not only is it a precursor to the neurotransmitter serotonin, but it also acts as a building block for the sleep hormone, melatonin. You can either take 5-HTP in supplement form, or your body can synthesize it naturally from l-tryptophan. In case you weren't aware, l-tryptophan is an amino acid that you can find in foods that are high in protein - such as dairy, nuts, and especially turkey. You have the option of either getting l-tryptophan from your food, or taking a supplement for it. With 5-HTP, however, you can only get more of it into your body if you take a supplement, or if you eat enough protein to help your body produce enough l-tryptophan to convert that into 5-HTP. If you ask us, taking a 5-HTP supplement sounds a lot easier and less convoluted than relying on your diet alone. Once you have a good amount of 5-HTP in your system, whether from a supplement or from protein sources, it goes on a magical journey which converts it into the neurotransmitters you need, when you need them. First, 5-HTP gets converted into serotonin. This is good news both during the day, and in the evening hours. Serotonin is the happiness molecule that millions of people are taking antidepressants for every single day. The reigning theory is that these drugs will boost serotonin levels in their brain, although their success rates and mechanism of action I know I understood by the scientific community. Regardless, not only does serotonin make you feel happy and content during the day, but it also helps you feel calm and relaxed at night so that anxious thoughts don't keep you awake. Next, there's melatonin. If your brain doesn't need the serotonin, or if the sun has gone down and your body is trying to get ready for sleep, the serotonin gets converted into melatonin. This sleep hormone is the main reason people feel sleepy at night - or rather, it's supposed to be. In our modern society, we are plagued with over exposure too bright blue light, which tricks our brains into not feeling sleepy when we need to. This light comes from everywhere - from your high definition TV, to your computer, to your cell phone and more. The light mimics the natural UV light emitted by the sun during the day, when you are supposed to be awake. When the sun goes down, this light goes away, and your body starts producing melatonin in anticipation of sleep. But if you're constantly bombarding yourself with electronic lights, your brain doesn't get the signal to produce melatonin. This can lead to restlessness and the inability to fall asleep or stay asleep. We have briefly touched on how to get more 5-HTP into your body already, but we feel it needs a more in-depth explanation. It's one thing to say "just take a supplement! ", but it's quite another to figure out which supplement to take, how much of it you need, and how your dietary Restrictions may have an influence and whether or not you can get the 5-htp you need. Not everybody can afford to eat a high protein meal before bed, and most people may not be able to. Many of the foods that contain the highest amount of l-tryptophan comes from animals or animal products; this gives people who follow a vegan diet a much more difficult time. Even vegetarian sources of l-tryptophan typically have lower levels than conventional sources of protein. And don't forget, 5-HTP doesn't exist in regular food - it has to be converted from l-tryptophan. If possible, try to look for a supplement who's 5-HHP is derived from griffonia simplicifolia. This is a perfectly natural plant-based source of 5-HTP from Africa which doesn't break the rules for vegans or vegetarians. Should I Take 5-HTP by Itself? In theory, you could, but you may be missing out on an opportunity to find a really high quality natural sleep aid. Yes, taking 5-HTP by itself can help with your restless nights; but there are tons of wonderful herbal sleeping pills that combine 5-HTP with other natural ingredients that are also known to help you relax at night and get ready for sleep. Specifically, you're going to want to look for a sleep supplement that combines 5-HTP with melatonin. Not only does this put more melatonin in your body at night when you need it most, but it gives your body the opportunity to produce more serotonin from the 5-HTP to further help reduce nightly anxiety which may keep you up. This effect is strengthened even further if you take a supplement with GABA, which is another neurotransmitter responsible for making your brain and your mood happy. Our favorite natural sleep supplement, Avinol PM, contains all of these ingredients and more. We strongly recommend that you give it a try!